New York’s Marine Resource Advisory Council (MRAC) met at the East Setauket, Long Island headquarters of the DEC the week prior, during which it was announced that MRAC was informed that Connecticut was pursuing action to extend their scup season this year. After short deliberation, MRAC officially called for an economic emergency on behalf of the recreational fishing community in New York’s marine district. 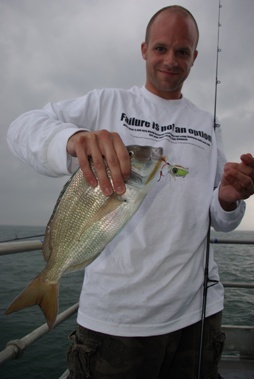 In a near-unanimous vote, MRAC members voted 8-0 (the two non votes included Charles Witek and MRAC chairman Bill Wise) to join Connecticut in calling upon the Atlantic States Marine Fisheries Commission (ASMFC) to accept New York’s plea for emergency rulemaking in order to keep the porgy fishing open longer in 2011. In making the motion, council member Melissa Dearborn noted that there is already a regional regulation for porgy between New York, Connecticut, Rhode Island and Massachusetts, calling Connecticut’s plan to pursue such a regulatory course a call to action for New York as well. “Apparently, Connecticut has the ability to change their regulations easier than us in New York. We were told that a change in New York would have to be through emergency rulemaking. I believe that the justification for this emergency regulatory change could be argued on the grounds of economic disaster,” Dearborn said. Citing the expected 86% increase in porgy harvest coming in 2012, Dearborn and nearly every other council member recognized that a seasonal increase for 2011 would do little to impact the overall porgy stock but could certainly accomplish a lot in terms of increased angler opportunity for this season. “Connecticut feels that we will be well under quota this year, we are getting a significant increase next year, the party boat industry is beginning their bonus season, the industry overall is hurting and there is cause for equality among the sectors to extend the season to both the private recreational angler and party boat sectors,” Dearborn said. The Recreational Fishing Alliance (RFA) and New York Sportfishing Federation (Federation) fully support this “bold move” on behalf of recreational anglers in the New York marine district. “This is a healthy fishery, an over-built stock actually, and it’s time for state regulators and elected officials to join anglers and local business owners in pushing for this emergency rulemaking measure on our behalf,” said Jim Hutchinson, Jr., RFA’s managing director and president of the Federation. “I’m only disappointed that Mr. Witek didn’t join the rest of the councilors voting to make this bold stance in support of our recreational angling community,” he added. In offering his abstention, Witek said there was no biological reason not to support the measure, but he explained that voting to continue the season and possibly put New York out of ASMFC compliance would be something that other states like Massachusetts could possibly do in other future situations. “The Federation and RFA are grateful to those councilors that voted with their heads and the hearts,” he added. The same fatally flawed Marine Recreational Fishing Statistical Survey (MRFSS) which NOAA Fisheries now uses to make emergency closures can certainly be used to make similar emergency openings when science and data supports it. “Biologically the scup fishery is in good shape. The state has no issue using emergency rulemaking if a fishery needs to be shut down due to overharvest, or to change an opening due to more restrictive regulations. Realistically, we can’t just ask for extended seasons whenever we under-harvest. However, in times of extreme economic hardship, our state needs to support us,” Dearborn said. For more information about seasons, sizes and bag limits in New York marine waters, visit http://www.dec.ny.gov/outdoor/7894.html.